Sensors (in medicine) is a special technical device that converts one physical phenomena in other equivalent terms. In medicine and biology often use sensors that convert mechanical displacement, light intensity, temperature or other physical quantities into electrical signals. The sensors are usually small size, small weight, give the opportunity to telemetry monitoring and recording, allow to measure small and fast-changing variable. All sensors in design and principle of conversion of the input signal into electrical divided into static and dynamic. Among dynamic sensors are widely used piezoelectric and electrodynamics. Piezoelectric sensors are used to register the various processes involved in moving and vibration of body parts (pneumography, palsgrave, mehanoterapija, stegnography). Dynamic sensors includes a thermocouple is used to measure the temperature of organs and tissues (Fig. 1). Electrodynamic sensors (Fig. 2) use for registration of various movements of the parts of the body (ballistocardiography, dinamomaniya). Static sensors, unlike dynamic, have an external power source. As a managed element of an electric circuit, they convert the insignificant impact of the object in high output electric signal. Managed schema elements can be resistance, inductance and capacitance. In line with this, there are sensors resistor (resistive), inductive and capacitive. To resistive sensors are coal microphone; strain gauge to check voltages; thermistor for temperature recording. 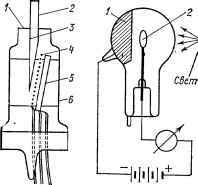 In the last device used, the principle of change of resistance of oxides of some heavy metals at change of temperature, which allows to determine with a high degree of accuracy. Most often use capacitive sensors with high sensitivity to various movements and working on the capacitance of the capacitor when you change the distance between the plates. Use them for registration of various movements occurring in the organs and tissues,is the movement of limbs, blood flow through the vessels, blood pressure (Fig. 3). To particular types of sensors are mechanoelectronic - mehanotron (Fig. 4), and optoelectronic - PV (Fig. 5)based on changing flux density of electrons between the electrodes electron tubes or transistors. In mechatronic this is achieved by changing the distance between the moving anode and cathode. They are very sensitive and are used for registration of mechanical oscillations of very small amplitude (ripple cells, fluctuations of the walls of the capillaries). 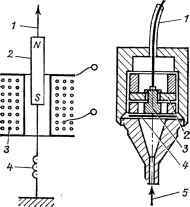 As a photoelectric sensor is used by the phototransistor or photocell, recording changes in the density of luminous flux emanating from an object or passing through it (photometry of various tissues at their histological examination, oxygamerya - determination of blood oxygen saturation).